2018 has been the year of Childish Gambino. From ‘This is America’ to ‘Feels Like Summer’, the multi-talented actor and musician has taught us all a very important lesson this year about the corruption of America, and now the entertainment industry, as his latest hit, ‘Feels Like Summer’, has been interpreted as a message on how the industry treats people of color. While the song itself is smooth, classy and full of chill vibes, people have also been commenting about the paired animated music video that came out this weekend. Childish Gambino’s style is very versatile, but you know when the people of the world need to be told the truth about the hidden lies, emotions and struggles of society today, he will be there, hit after hit, giving us the message we all need to hear. ‘Feels Like Summer’ did just this, if not, better. I wouldn’t be lying if I said that this might possibly be my favorite song of the year, and the Marvin Gaye ‘What’s Going On’ feel it’s got, makes it ever so soulful and a pleasure for the ears. The video is completely animated and begins fading from a black screen into a covered window, which emerges into white light and shows Glover walking down a homely street, with the deep-orange tone sunset in the background. It’s important to mention what this might mean, as this could possibly imply that we never know what goes on behind closed doors until someone shines a light on the hidden reality that many face. What’s even more amazing, is how Glover sings the lyrics “you can feel it on the streets, on a day like this, the heat, it feels like summer.” A lot of people in the industry talk about the heat and pressure that’s on them to be a role model, or be the most successful, and this line paired with visuals explains this perfectly, as the pressure that the heat puts on people during summer, is what many celebrities face on an emotional level every day. Everything suddenly goes hazy, then fades back into a clear shot of Lil Pump and 21 Savage shooing away young fans who won’t leave them alone. We see cameos from Migos, Azealia Banks, Beyoncé, Drake, the list goes on. Notably, the cameo that most people are talking about, and not for the right reasons, is Kanye West and Michelle Obama. 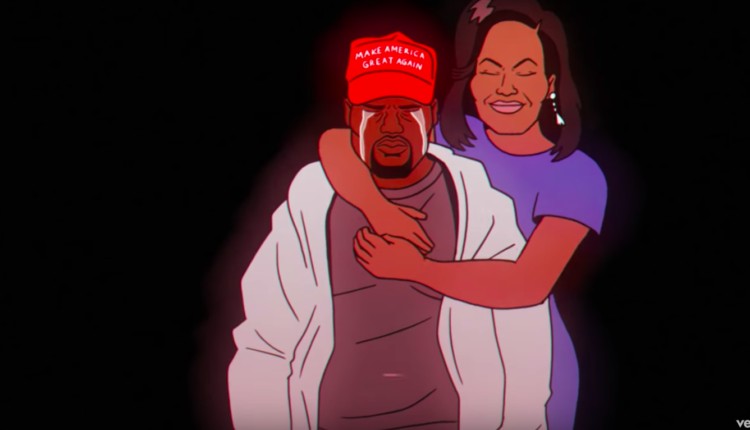 Kanye West is pictured crying with a ‘Make America Great Again’ hat on, whilst Michelle Obama emerges from the black background, ready to console Kanye in his desperate time of need. Although we think that Gambino’s message here was that no matter how much you betray someone in the media to seem like someone you’re not, the same person you betray will always be the one that come back to help you in your time of need. However, for those across social media, this message wasn’t put across very clearly, and people assume that Gambino thinks that black women should always be the ones to console everybody, and that they should always put their issues aside, so that they can help others first. 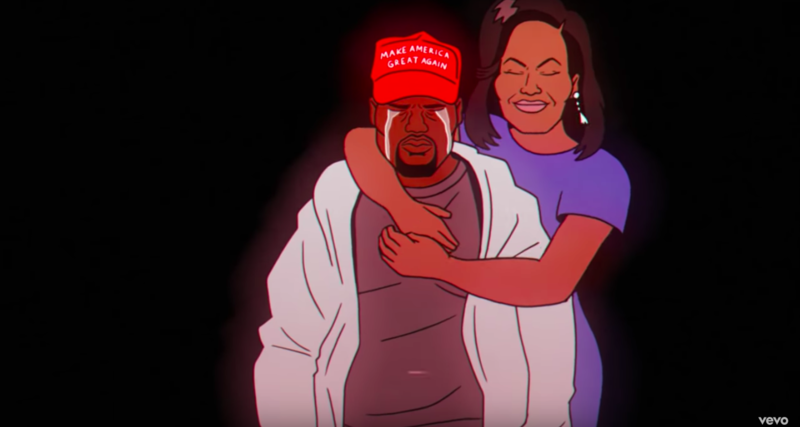 Some people saw the scene as iconic, mentioning that it could possibly show how Kanye is going through a very tough time right now, and could use a mother-figure in his life to help figure things out, which is where Michelle steps in. Honestly, the number of hidden gems in this video is unreal, it’s full of important messages and shows the cruel reality of how we view those in this industry. Take Nicki Minaj’s cameo for example. She’s pictured with Travis Scott, playing with some building blocks. Minaj carefully builds up the blocks implying that Nicki has tried so hard throughout her career to build an empire from nothing, in order to gain the amount of success that she has today. But then Travis Scott takes away the bottom block, and Minaj watches her empire crumble. How quickly did they animate this anyway? The song ends with animations of the late Whitney Houston who is pictured floating on a black background with her eyes shut and the late Michael Jackson, back in his happy days, pictured laughing away as the screen fades to black. These scenes could possibly show how this corrupt industry changed them, and how cruel people were to them whilst they were around, with the media constantly keeping a watchful eye on them, just so they could tear them down at their weakest moment. Perhaps these implied messages are the reason why they left this world too soon. Taking apart the biggest message from this video, is that all of the cameos shown, and the events linked to them, have all happened throughout this summer, hence the title ‘Feels Like Summer’. As the song comes to a close, the lyrics “Oh, I hope this world will change” is sung, as the screen shows Gambino taking one last look at the world, as he goes back into his home. It really has been an eventful summer, and Gambino has one again, not surprisingly, taught us a valuable lesson of how we need to be kinder and stop bringing each other down. We can only hope the world will change too, Glover. What do you think of ‘Feels Like Summer’? Do you think Childish Gambino has once again created an iconic, yet soulful number one hit? Let us know in the comments, or on Twitter at @WhatsTrending.